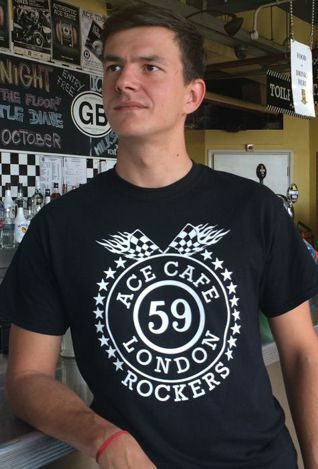 Quality short sleeve black t-shirt featuring the 59 Club & Ace Cafe logo. 59 Club & Ace. Fifty year on, and having worked together since the very first Ace Cafe Reunion of 1994, through to the full re-opening of the Ace in 2001, the sharing of history, heritage, community and common values, has brought the 59 Club and Ace Cafe London ever closer together, and with the advent of ever increasing interest in the two legendary and iconic institutions, both have agreed to team up together with a view to ensuring a long and successful future for the club into the 21st century and beyond!